In the following Preterist commentary on Luke 6:47-49, Jesus tells a parable with a hidden end time message the meaning and fulfillment of which is explained below. 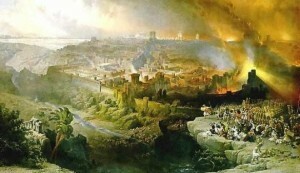 The siege of Jerusalem in A.D. 70. This catastrophic war is hinted at in Luke 6:47-49. A Preterist Commentary on Luke 6:48-49: Floods represent Foreign Invaders. The Destruction of the House or Temple by the Romans signifies the Fulfillment of the Law. The house mentioned in vs. 48-49 is the temple in Jerusalem, which Jesus predicted would soon be destroyed: “Look, your house [the Temple] is left to you desolate (Matthew 23:38).” Jesus was right, the Temple was, in fact, destroyed in A.D. 70. With the Temple in ruins it was no longer possible to carry out many aspects of the Law of Moses. As a result, Biblical Judaism had come to an end. The religion practiced by Jews today bears only a slight resemblance to the religion handed down by Moses. Called Rabbinic Judaism, this religion is a form of Judaism adapted to the destruction of the Temple. 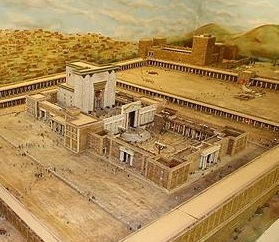 As stated above, the house built on the ground is the Temple in Jerusalem which represents the Law of Moses. The house built on the rock would not suffer the same fate. What is the house built on the rock? A Preterist Interpretation, Exposition and Commentary of Luke 6:48: The Rock is the Leader of the Christian Church. A Preterist Commentary on Luke 6:48: The House Built on the Rock is Christianity. Therefore the house built on the rock is Christianity. 2 Corinthians 6:16 says, “[W]e are the temple of the living God.” The house built on the ground represents the temple of stone destroyed at Christ’s return during the Jewish War. The house built on the rock represents the true temple of God. Unlike Biblical Judaism which came to an end at the destruction of Herod’s temple, the Christian church founded on Jesus’ teachings is a temple that will never be destroyed. 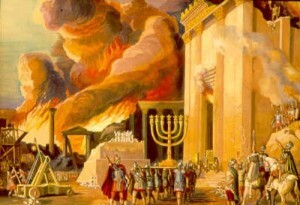 Herod’s temple was destroyed by the Romans in A.D. 70. This temple is the house built on the sand in Luke 6:49. The house built on the rock is the temple of the living God which according to 2 Corinthians 6:16 is the church. A Realized Eschatological View and Commentary of Luke 6:47-49: The House may also be the House of Israel. There may be another layer of meaning to this parable. The house in vs. 48-49 may also represent Israel. The kingdom of Israel is often called the house of Israel throughout the Bible (Psalms 135:19; Isaiah 46:3; 63:7; Jeremiah 2:4; Ezekiel 3:1). Therefore, the first house built upon the rock may be Christian Israel. 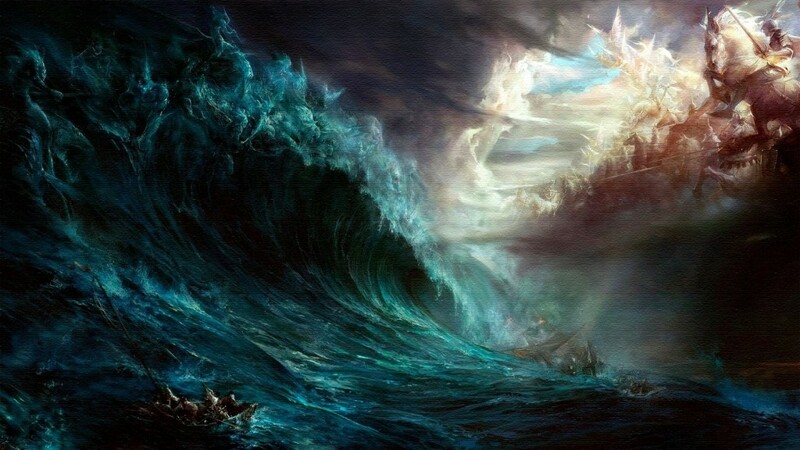 The second house that is destroyed by the storm and flood is thus non-Christian Israel. 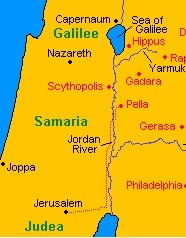 The flood that collapses the second house represents the Roman army that destroyed apostate Israel in A.D. 70. Having fled to Pella, the Christian church was largely unmolested by the war. In the thousand years after the Jewish War, Judea grew to become 95% Christian by A.D. 614.2 Christian Israel represents the house built on the rock that withstood the war or storm. In this Preterist commentary on Luke 6:47-49, Jesus tells a prophetic parable whose meaning and fulfillment points to the Jewish War and its aftermath. Thomas A. Idinopulas, Jerusalem Blessed, Jerusalem Cursed: Jews, Christians, and Muslims in the Holy City from David’s Time to Our Own (Chicago: Ivan R. Deer, 1991), 102. As for the leader of the church, Peter as you said, being the rock I have to disagree. 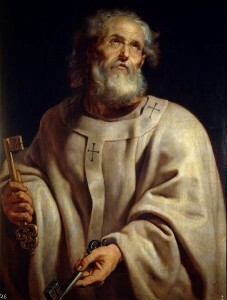 First, James the half brother of Jesus was the leader of the church. Secondly, the “rock” that Jesus called Peter, means a pebble, while the rock that Jesus said the church would be built on means a boulder, or mountain.. Therefoee Jesus said. The church would be built on Him, not Peter, as only the Word of God can build a real church. Thank you for your insight James. Let me clarify. Of course Jesus is the ultimate rock upon which the church is built; however, who were the people who were right there with Jesus at the inception of the church? The disciples of course! Thus confirming the fact that the disciples alongside Christ are the rock that forms the foundation of the church Revelation 21:14 says that the wall of teh New Jerusalem has 12 foundation stones which are the 12 disciples. Jesus also forms that foundation as Jesus is called the chief cornerstone in the NT, the ceremonial first stone placed on a building’s foundation.